Just wanted to say thank you for such a good job with the engagement ring by ordering something else. You guys are awesome. My fiancÃ© has had so many compliments on her ring. Thanks again. 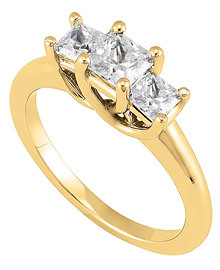 This 14k yellow gold three stone ring can accommodate a princess center stone ranging from 0.22 carats to 0.82 carats. The sidestones all have a color of G-H, a clarity of SI and a total carat weight without the center stone of 0.38 carats. * Carat total weight has a variance of + or - 0.03 carat. Search our inventory of certified loose diamonds and design your perfect diamond ring.